Roota Engineering, the Rotherham-based sub contract precision engineering company, is to play a key part in the Precision Machined Components division of AIM-listed Pressure Technologies, as the Sheffield firm splits into four business sectors. Pressure Technologies plc owns Chesterfield Special Cylinders, a leader in the design, development and manufacture of high pressure seamless steel gas cylinders, and has gone on to bring in the likes of Chesterfield BioGas and Al-Met Limited and Hydratron group of companies. It acquired Roota in March in a deal worth £13.5m, taking on its Meadowbank Industrial Estate facility that has both CNC and conventional turning and milling capabilities and specialises in the machining of difficult materials and exotic alloys such as inconels and monel. Reporting its financial results for the year to September 27, Pressure Technologies saw revenue up by 57% to a record £54m whilst pre-tax profit increased from £2.9m to £5.3m. The Group acquired a number of firms in order to diversify and reduce the impact of cyclicality in the oil and gas industry with engineered products now the largest part of the Group. The diverse product portfolio and broader industrial focus now encompasses smaller capital projects and consumables with divisions comprising Precision Machined Components, Engineered Products and Alternative Energy set to drive the Group's growth, with Cylinders enhancing Group profitability. Each division will be headed by a managing director, supported by a dedicated finance director. The move towards a new divisional structure has already begun and will be fully implemented during the 2015 financial year. Roota, which produces a range of components for flow control and downhole tools, complements the Group's other acquisitions, with Roota generally focusing on larger, longer products. 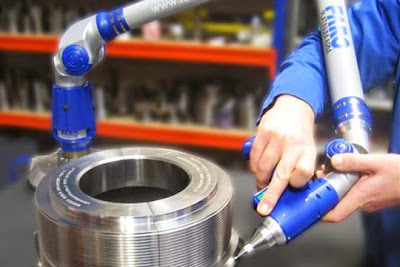 The Rotherham firm already had a number of "blue chip" customers and specialises in the manufacture of bespoke engineered products for the oil and gas industry, such as components for high added value ball valves, mandrels, connectors and well-head cleaning tools. Whilst the order book remains stable, Pressure Technologies reported that the market became subdued during the second-half of 2014 as oil companies began to delay major projects. Firms such as Royal Dutch Shell and Exxon Mobil turned to asset sales and spending cuts rather than boosting production. The Group sees significant organic growth potential and progress should still be made in the next financial year as Roota and others in the Precision Machined Components division manufacture many products that are consumables, so there is an ongoing requirement for replacement parts from oil and gas production. Alan Wilson, chairman of Pressure Technologies, said: "The Group will continue its growth strategy of combining acquisitions and organic growth. The priority with recent acquisitions is to complete their successful integration, but we may pursue further acquisitions if the right opportunities present themselves. "Continued organic growth must be viewed against a background of low global economic growth, geopolitical tensions and oil price uncertainty. Whilst it is pleasing to report that the Group ended the year with a like for like order book 14% higher than last year, we expect a reduction in sales into the deepwater oil and gas market in Cylinders, but continued growth through our other divisions as a result of our market position and the full year contribution of recent acquisitions. "The Board views current market conditions with caution, but we start 2015 in a much stronger and more balanced position overall, so I am optimistic about the year ahead." The report added that capital expenditure on new machining equipment will almost double in 2015, from just over £1m in 2014 to around £2m. Pressure Technologies acquired Roota for a maximum consideration of £13.5m (plus cash balances) comprised of an initial net cash consideration of £9.0m (plus cash balances) with additional deferred payments of up to £4.5m, based on the future financial performance of Roota. The latest report shows that directors expect that all profit targets will be met and that the maximum consideration of £4.5m will become payable.